With the exception of warm, muggy and breezy conditions it will be a rather quiet evening. Winds WSW at 10-15mph. Low near 79. 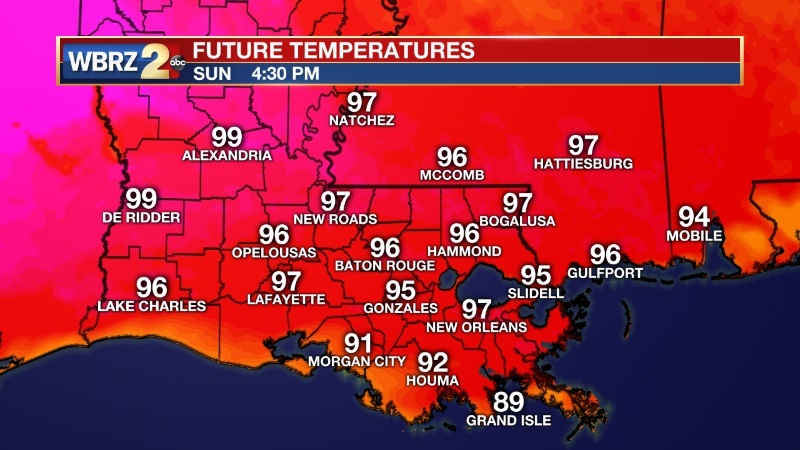 Extended heat advisory until 8:00 p.m. Sunday. This means temperatures topping the upper 90s along side high dew points (humidity) leads to heat index values of 105-110 degrees during the peak of day. Heat related stress can strike anyone of any age. Think of outdoor pets and even sensitive plants as they may need additional care. Take caution and stay hydrated, drink plenty of fluids if you must be outdoors. Maybe consider indoor activities until we get a break from the oppressive heat next week. A chances for seeing wet weather limited at this time, however a stray pop up storm at a solid 10% or less possible. Otherwise forecast remains all about the heat. Heat could linger through Monday. Be aware if you are required to be outdoors for extended periods of time. Daytime highs likely to top back in the upper 90s while high humidity will make it feels like 105-110. Rain chances mainly locked down at 20% or less, however a break from the trend will likely come alongside a front expected to approach the middle part of the week. 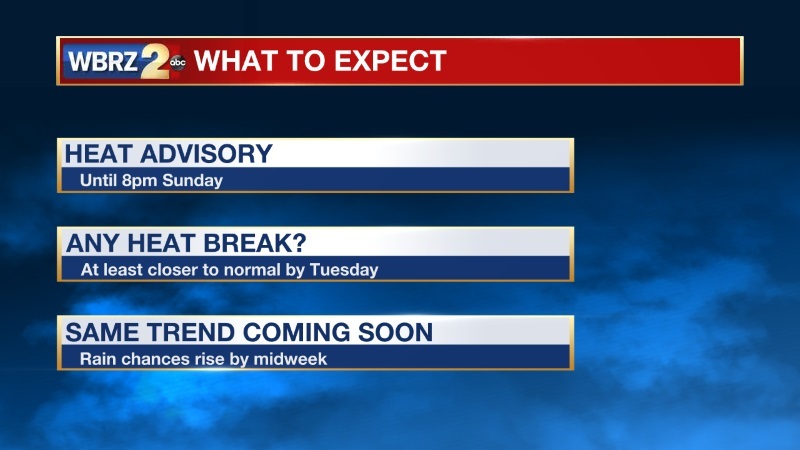 Heat advisory continues, any relief in sight?